Shattered Glass Targetroids Optiaim and Hot Flame. 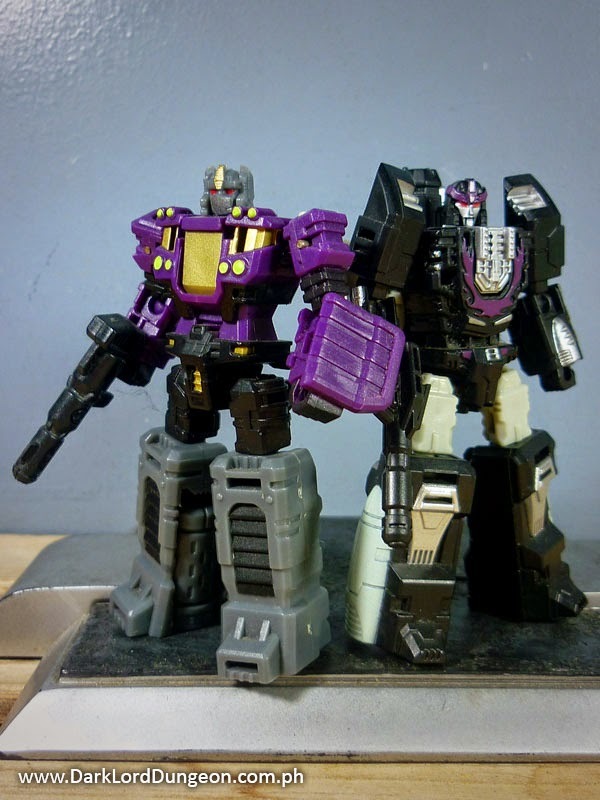 Presenting the Shattered Glass versions of the Targetroids Optiaim and Hot Flame from TFC Toys. Or we could just say the Shattered Glass versions of the Targetroids Optimus Prime and Hot Rod (Rodimus Prime) since Hasbro probably won't go after us for copy-right violations - we hope. We first featured the Targetroids Optiaim and Megashoton all the way back in 2011 and left the collection alone till we saw this on a Facebook forum and just had to have them for the Shattered Glass Prime (he's still a Prime after all) - we would later grow to love Hot Flame as well - but for a reason that we will discuss later. To the uninitiated the Shattered Glass Universe is a fictional alternate reality where Earth is under attack by the evil Autobots with the only thing standing in their way being the virtuous Decepticons. So these are bad guys. Presenting the Valkyrie from the Marvel Universe Infinite Series Toyline. This is the Valkyrie Brunnhilde - she who was chosen by Odin himself to lead the Valkyrior, "the Choosers of the Slain, a group of warrior goddesses who would appear over the battlefields of mortal worshippers of the Asgardian gods and choose which of the fallen were worthy to be taken to Valhalla, the land of the honored dead in the dimension of Asgard". To the uninitiated this is also Annabelle Riggs - an archaeologist who has the distinction of being Valkyrie's human host - after having been killed by a rage-filled berserk Valkyrie who then, remorse filled and with the help of Clea, gave up... half her existence (?) so that Annabelle could come back to life. Today they switch forms. Whenever Valkyrie is needed, that's when she appears. Presenting Powerglide from the Transformers Combiner Wars toyline. In 2012, we reviewed the Transformers Dark of the Moon Cyberverse verson of Powerglide and we were quite happy with the modern depiction of the figure back then. 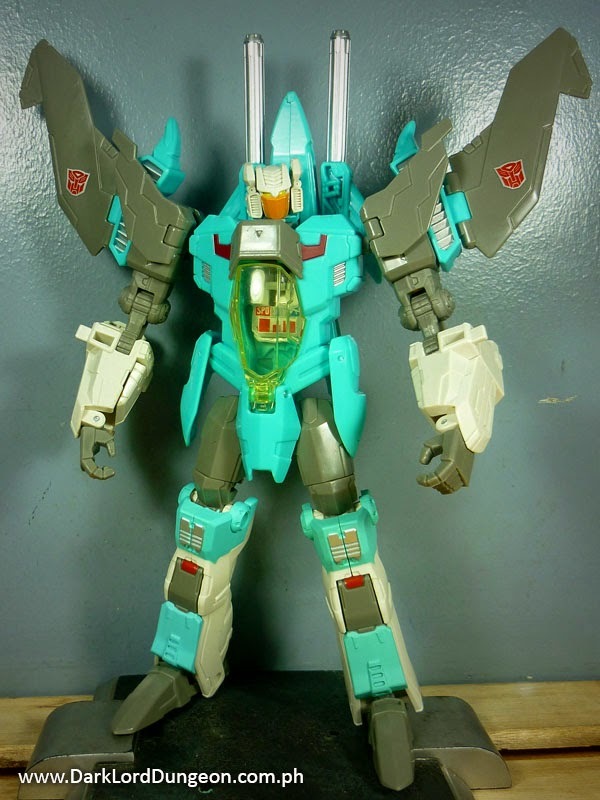 We did however cite him for having big feet, a cantaloupe between his legs and the loss of articulation due to the fact that his wings were positioned on his outer arms instead of being next to his body like his original incarnation and this Combiners Wars version. 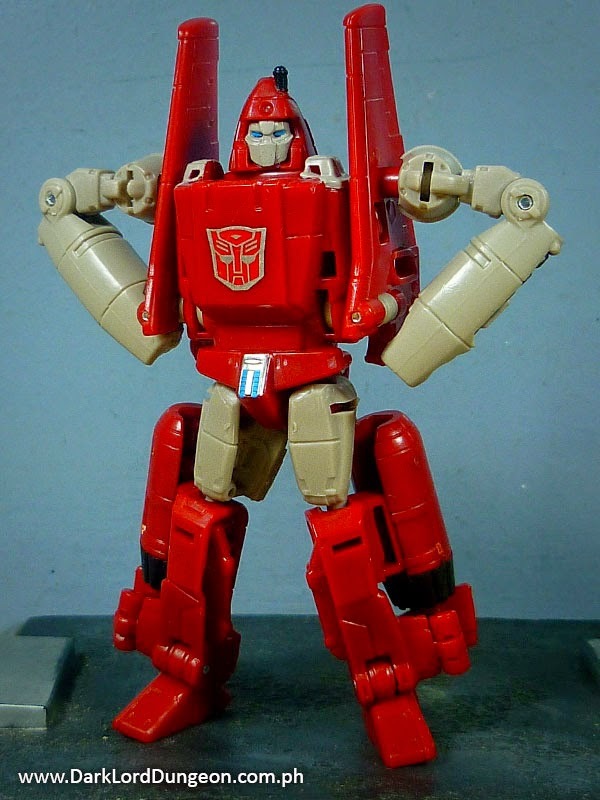 Anyway we're particularly fond of the Autobot flying daredevil because of the fact that he is the only Autobot - that we can think of - that fell in love with a human female -socialite Astoria Carlton Ritz. Who gave Powerglide a broken heart. Presenting the Headmaster Brainstorm from the Transformers Generations toyline. To the uninitiated, this is actually two characters: A Nebulon scientific genius who created the HeadMaster Technology called Arcana, and; an equally gifted Autobot called Brainstorm. When Koraja, the Nebulon capital was seige by Decepticons, they actually had Autobot prisoners who refused to act unless the people of Nebulon trusted them. As a compromise, Arcana developed a procedure that would allow him to merge with the Autobots and gain some form of control over their actions. The Autobots agreed and the Headmasters were born. He/they would later go on to handle the reconstruction of Fortress Maximus and be among the first victims to be eaten by Uniron - who found him "Pathetic but tasty"
Brainstorm would later be rebuilt - sans Arcana (Dead) - using his original head. 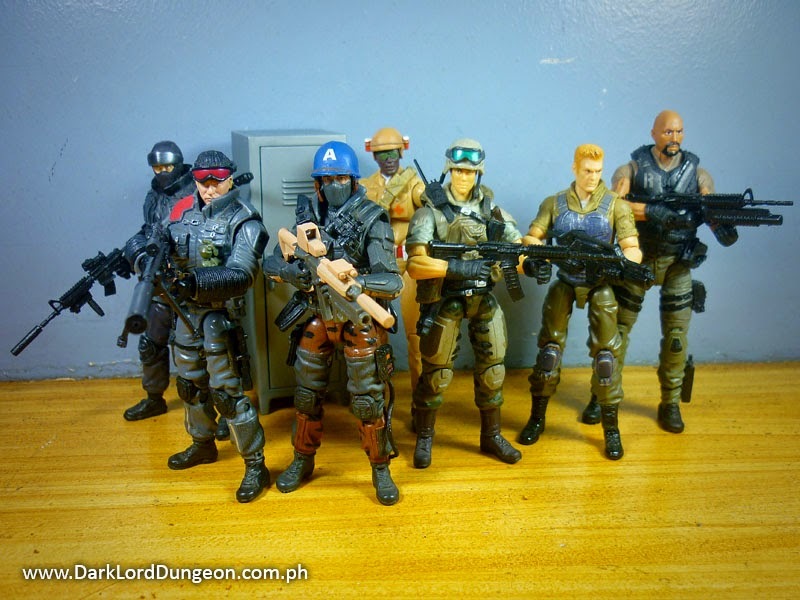 We at the Dungeon recently found some GI Joe Alternative Weapons: Fully modular modern military weapons (Well... one sci-fi weapon) and we thought we'd try to share it with you all in a more creative fashion. 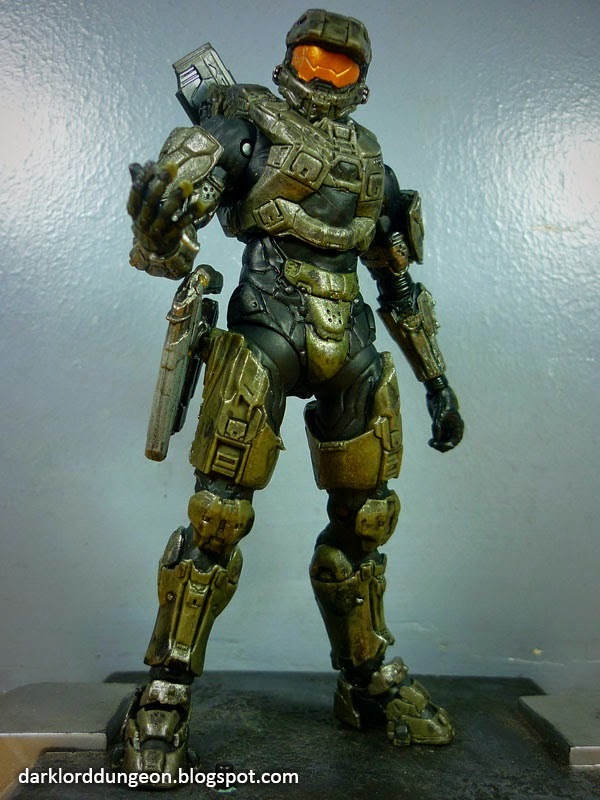 Presenting the Master Chief from the upcoming video-game Halo 5: Guardians - as depicted by McFarlane Toys. This is without a doubt, one of the saddest figures in the Dungeon. We'll talk about it later, but if you haven't seen the Halo 5 Guardian's video, then we need to tell you that Master Chief to your left is holding and looking at the recently departed Cortana's data crystal chip which he still keeps with him tied with a chain like a necklace or omamori. So expect Halo 5 to contain a lot of Heartbreaking moments as the Master Chief struggles to come to terms with his loss - or hopefully fights to restore his loss - and perhaps figure out one of Cortana's last requests to him "Before this is over, promise me you'll figure out which one of us is the machine." Presenting the MP-10 Replacement Hands and Ion Cannon for Optimus Prime from KFC. AKA the KFC (Keith's Fantasy Club) KP-06. If you read our Year of the Horse MP10 Optimus Prime Review, you would have noted that we cited it for having poor hand articulation, and; we totally enjoyed how the UFO Replacement Hands beefed up our movie Optimus Primes; so we absolutely had to get these when we saw them on Ebay. The fact that the KFC-KP-06 came with an improved and more realistic sized version of Optimus Prime's Ion Cannon seemed quite trivial to us since we really didn't mind the smaller ion cannon. What did get us though was that a few weeks after purchasing this, we saw another version of the KFC-KP-06 intended for the YOTH Optimus Prime. What we have is the one intended for the plain old MP-10. 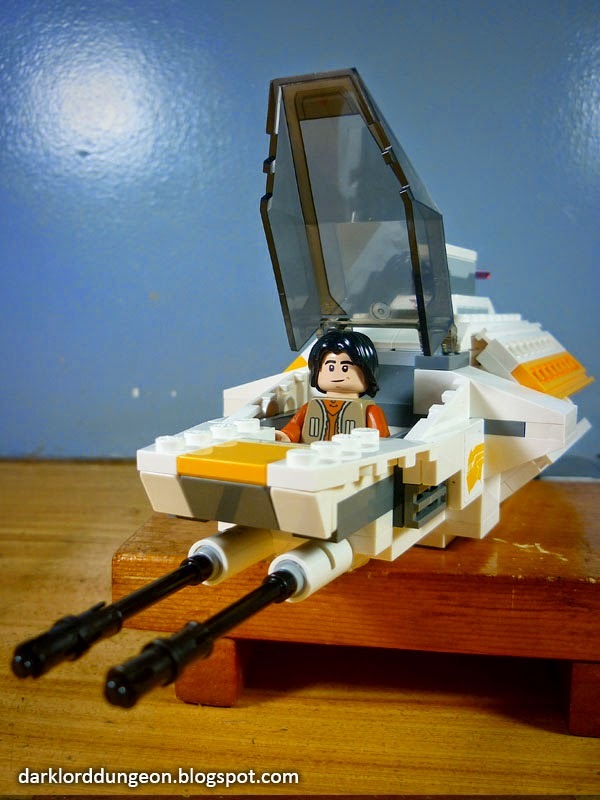 Presenting the LEGO version of The Phantom from the Star Wars Rebels Animated Series. With the Lego version of thief, all-around scalawag and Jedi Padawan Ezra Bridger at the helm. To the uninitiated the Phantom is a Corellian Engineering Corporation Attack Shuttle that docks with the Ghost - while docked, it serves as the tail-gun of the Ghost keeping in line with the B-17 design of the Ghost. It comes armed to the teeth and actually packs a punch - though it trades off defensive power for its firepower. The Phantom comes armed with a of Taim & Bak MS-2B twin laser cannon up front and a Taim & Bak KX4 dorsal laser turret up top. Hello. I am Baymax, your personal Healthcare Companion. Presenting the Dr Wu MO 02 Mercenary Belly Add-On for the TF4 Hound. When we reviewed TF4 Hound all the way back in June prior to the Transformers Age of Extinction's release, we admit that we did not bother to check the spoiler images on-line. Then surprise! TF4 Hound was fat! He was so fat, he collapsed in the movie not because he was dying in the last stand that Michael Bay put him in, but because he was freakin exhausted from all exerting himself. 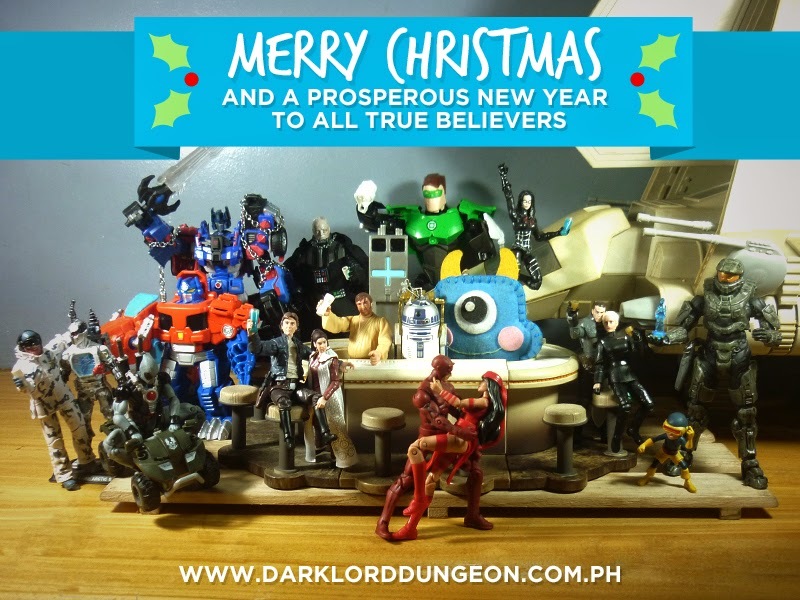 Quite different from the barrel chested wall of a figure that we reviewed back in June. 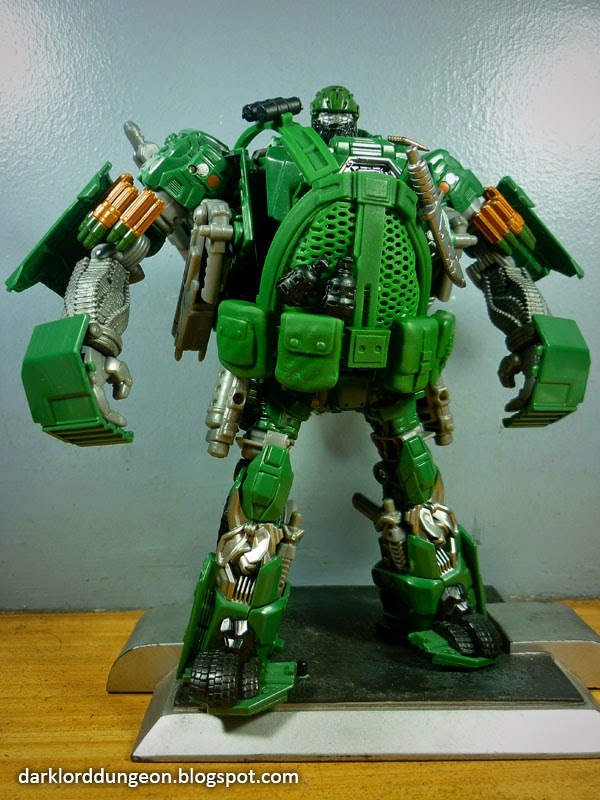 The only redeeming thing out of the TF4 Hound was that he was voiced by the wonderful John Goodman but frankly he looked more like a Bulkhead than a Hound. Perhaps Bay should have called him Bulkhead.